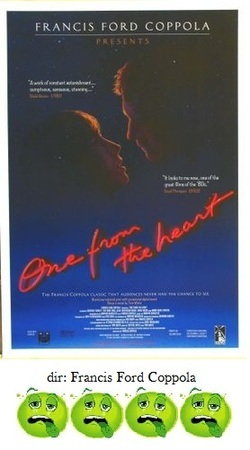 In 1982, Francis Ford Coppola's One From the Heart was promoted and positioned to be the cinematic event of the year. Instead, it was a financial sinkhole that bored audiences into a stupor and sent Coppola towards bankruptcy. So, what happened? One From the Heart was trumpeted by Coppola as the next wave of film making technology. The technological aspects of the movie are very impressive to be sure, but by burying himself underneath all of the bells and whistles, the computers and digital editing techniques, the massive sets all contructed on the soundstages of his production company, the blinking lights, the neon and the intricate art direction, he totally lost touch with the fact that the script was about two unlikable, shallow people saying and doing absolutely nothing. The entire film can be boiled down to one, single sentence: Frederic Forrest and Teri Garr, a couple celebrating their 5-year anniversary, have a fight, break-up, have brief affairs with other people and then get back together, because they really do love each other. Period. There's barely enough here to sustain even a very low-budget romantic Lifetime movie let alone one that cost nearly $30 million. Anyway, at the beginning of One From the Heart, which takes place in Las Vegas (that was completely recreated for the soundstages), Forrest (who's kind of a chauvinist) and Garr (who's sort of a pill) have a spat to end all spats. While nursing their wounds, and with the not very helpful advice of friends Harry Dean Stanton and Lainie Kazan, they prowl the Vegas streets and meet their fantasy soul-mates (I suppose). For Garr, there is suave, Latino waiter Raul Julia, and for Forrest, a svelte, German acrobat (? ), played by Nastassja Kinski. In any case, after a one day affair, Forrest decides he wants Garr back, and Garr very nearly leaves with Julia on a vacation to Bora Bora (in fact, Bora Bora is mentioned so many times in this movie one could build a drinking game around it). But, alas, Garr spurns Julia and returns to Forrest. They are their own true loves, and, boy, they deserve each other. It's amazing how so much money and energy went into such a simple-minded story such as this. If the characters played by Forrest and Garr were, at the very least, written better and given any likable qualities whatsoever, then maybe, maybe, it all could've been made to work. But, they aren't likable, and we don't care that they've broken up and we certainly don't care if they get back together. So what we are left with is the experience of watching these two dolts walk around the elaborate sets while being constantly bathed in blue, green and red light, whining and complaining. At least with the arrivals of Julia and Kinski we get someone else to watch for a while. Yes, One From the Heart is a feast for the eyes, but the heart and intellect are left starving. One From the Heart was a financial disaster, losing almost all of the money invested, and it deserved to be. It was a tiny, little trifle that completely collapsed under the weight of the huge budget, the huge sets and the huge ego who thought he was giving the world some sort of gift. Sadly, he didn't keep the receipt.